For years, fans and readers have been asking Steve to write a book detailing some of his photography tips and techniques, and now his most recent book, “The Joy of Nature Photography,” fills that request. Here, he provides 101 separate tips anyone can follow to improve their pictures. 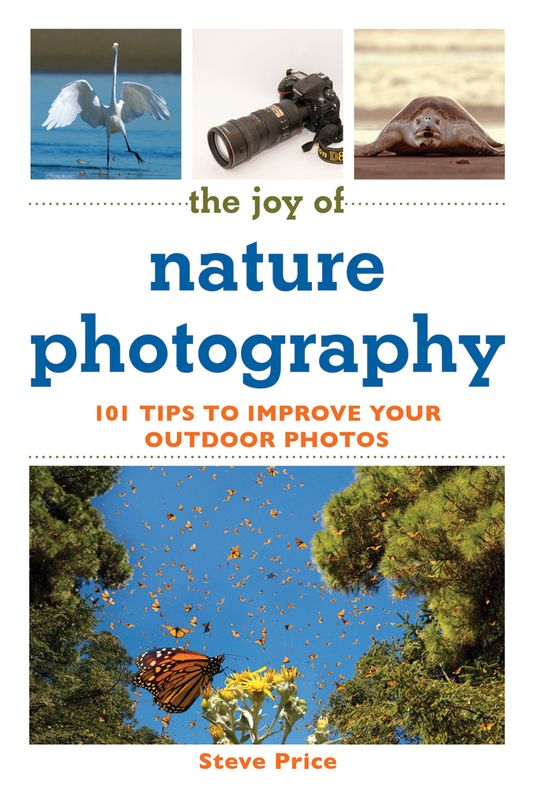 Written primarily for beginning and amateur photographers who use digital SLR cameras, and written in Steve’s informative and easy, entertaining style, “The Joy of Nature Photography” covers such topics as Choosing Equipment, Composition, and Reading Light, but doesn’t stop there. Additional chapters describe special wildlife and landscape techniques, and even how to use remote trail cameras. Photographers who prefer compact cameras, iPhones, and iPads are not neglected, either, as Steve has chapters and tips on how to use each of them more effectively, too. He concludes the book with a chapter titled Your Digital Darkroom, and includes eight basic, easy to try tips for digitally improving your images with either Photoshop or Photoshop Elements on your computer. Here you’ll learn the basic steps nearly all professional photographers use today to finish their photos. Each tip is illustrated by one of Steve’s photographs, stunning images he has taken from throughout the United States and in many foreign countries. The photos illustrate how to use different lenses, the effects of certain filters, or show the angle of light, all key ingredients to improving your own photography. As a bonus, each chapter also includes a short Personal Interlude, as Steve describes one of his own photography experiences from around the world. He tells you how he captured an African leopard jumping into the air in the darkness to catch a flying guinea fowl; filming sea turtles in the rain in Costa Rica; or photographing fighting bighorn sheep in Wyoming. Each relates directly to one of the chapters in the book, and shows how he used the very techniques he describes. Published by Skyhorse Publishing, “The Joy of Nature Photography” is available for $14.99 from Amazon.com., Barnes and Noble, and other bookstores nationwide.